My first teacher professional development course at Stone Lab pushed me beyond what I thought I was capable of doing. I became a better educator, better learner and a better citizen. This was the first legacy project at Dublin Jerome High School. 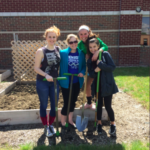 These students built 3 raised bed gardens. 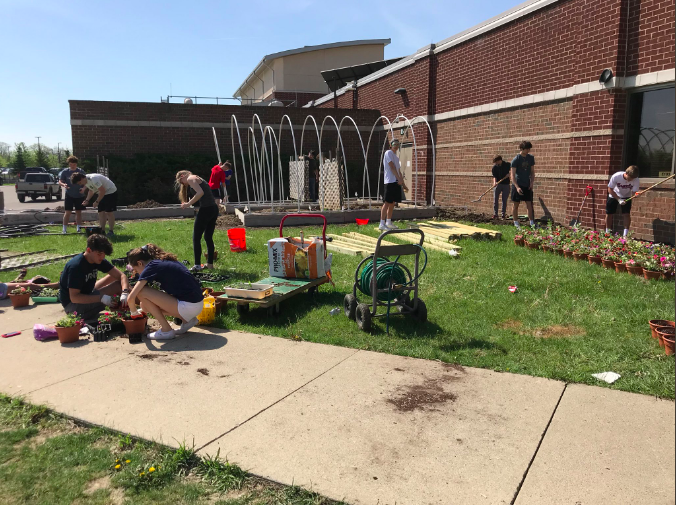 Students wanted to be able to garden throughout more of the school year so they designed hoop houses and a rain water diverter irrigation system. Two groups of students built these and installed the irrigation system. 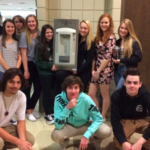 Students that worked on this legacy project sold 600 reusable water bottles that paid for the 4 filling stations around the school. 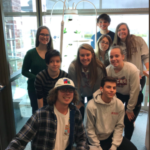 For this legacy project students raised money through seedmoney.org to purchase 3 full Juice Plus Tower Gardens. They built, started and maintained these gardens throughout the year and summer. 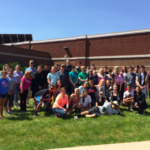 Every year, students from the previous class volunteer over the summer to come in and help maintain the gardens and water if needed. Without their help, the projects at Jerome would not be successful! 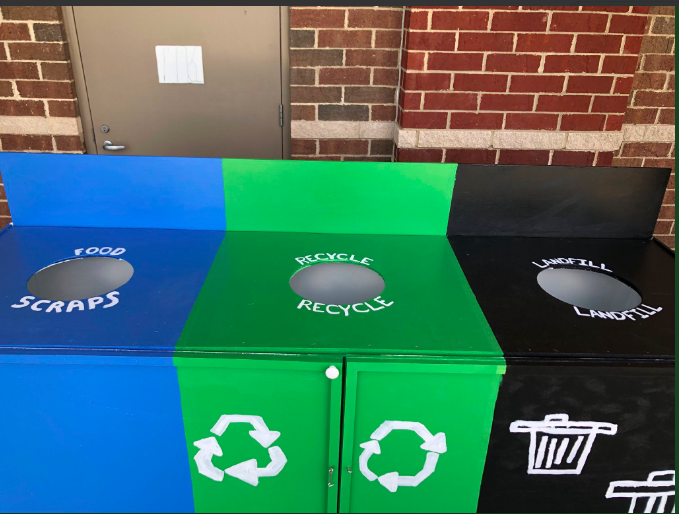 After performing a trash audit of the school cafeteria waste, a couple of groups of students designed and built recycling stations to divert waste to the correct place. Additional projects are in the works to use the food scrap waste in an innovative way. Unfortunately for my students, we are landlocked and the Great Lakes are not right around the corner. Bringing the lakes to the classroom is critical and really allows the students to see what the Great Lakes have to offer. It is really important for high school students to think about the Great Lakes in terms of Ohio’s economy, in terms of developing an awareness of the major cities in our state and think about their “backyard watershed” and how their choices affects the water which in turn affects the environment which in turn affects us. Before spending the last couple of summers at Ohio Sea Grant’s Stone Laboratory taking teacher professional development courses, I had never been to any of the Great Lakes and now I can’t stay away. I continue to take courses at Stone Lab every summer, take tons of resources back to my classroom, and can’t wait to take my students up there in the future. It is really hard to choose a favorite activity or experience because there are so many but if I had to choose one I would choose How Well Do You Know The Great Lakes?. This is a great way to introduce the Great Lakes to my students and give them some background information. This year I tried to integrate this lesson a new way. 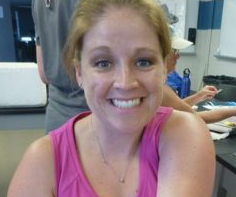 Angela Greene, Ohio Sea Grant Education Specialist, shared a Google Hyperdoc that she created. Hyperdocs are digital documents that contain all the components of a learning cycle within one digital document. This Hyperdoc linked all the resources that were needed to complete the learning cycle. Embedded within the Hyperdoc was a small pre-assessment, numerous different technology platforms including Flipgrid, Google Docs and Google My Maps, a hands-on Great Lakes modeling activity, and various collaborative group activities. My students, who knew nothing about the Great Lakes at the beginning of the lesson, were excited and were successfully sharing how a drop of water could travel from Lake Superior to the Atlantic Ocean. Environmental Science is an almost all hands-on class with 99% of the work done in class. Students are always challenged with new technology and challenging issues. I like to get the kids outside as much as we can and make the content relevant. 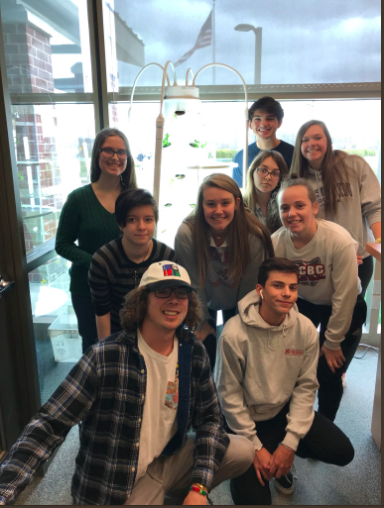 Having the various types of gardens (outdoor, greenhouse, aeroponic tower and aquaponics) allows students to really be immersed in the content. We go outside and look at water quality and will be using the Hydrolab (Limno Loan program) to gather real-time data. When we study the atmosphere, students gather carbon dioxide data from their own vehicles and compare vehicle types. There is always a lot of collaborative work going on in the classroom! Throughout my professional development opportunities I have met so many great researchers and scientists that have all impacted my learning. Even if they haven’t personally come and talked to my classes and students, their knowledge and expertise is used in the classroom. I have loved working with naturalists from the metro parks, officials from the Ohio Department of Natural Resources and OSU Extension program, as well as education specialists from Ohio Sea Grant. This year my students have been invited to Byrd Polar and Climate Research Center and will take part in a lesson run by scientists on climate change. Along with scientists, my students have worked very closely with irrigation specialists, landscape designers and community agencies to design and build their legacy projects. Seeing these professionals do the work they do in their field, has provided a real-life model for my students to consider when thinking about post-high school employment/education. 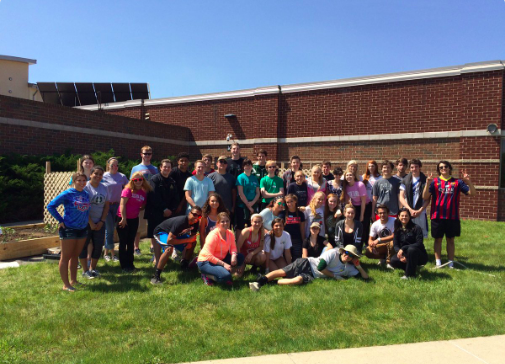 For the past couple of years my students have taken part in legacy projects at Dublin Jerome High School. Each year, students have brought to class issues around the school that were concerning to them or ideas that they wanted to see in class. 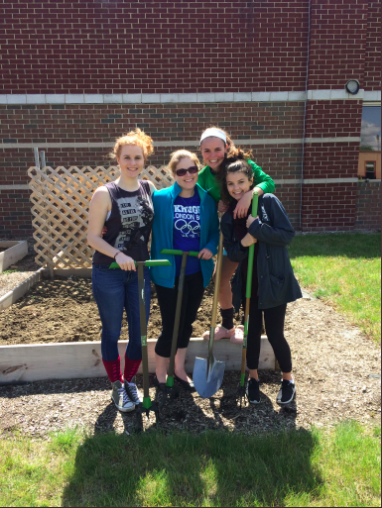 Three years ago, my students built three 8’ x 16’ raised bed gardens on our school property and maintained them over the summer. The next year, students were upset about the number of disposable water bottles that were being purchased and used in the school. 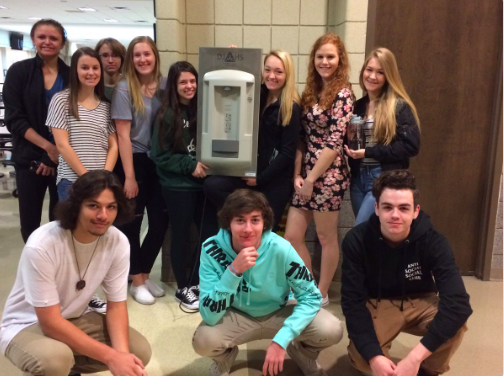 That class sold self-designed water bottles and raised enough money to install 4 water bottle filling stations around the school. This past year, all of my classes wanted to do individual projects which was a MASSIVE undertaking. Each project, despite numerous challenges, were successful. 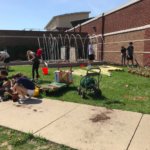 My students installed a rainwater diversion irrigation system to water the outdoor gardens, designed and started the building of hoop houses for the existing raised-bed gardens for cool weather gardening, purchased three aeroponic tower garden systems and built recycling stations for the commons. 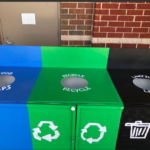 One additional project that has continued into this year could lead to a new composting technology that has not been placed in schools yet. Because of my students’ desire to make their school better, they have inspired other students to make a difference and to challenge the upcoming classes to find their passion and leave their legacy.